Total Basement Finishing is a certified installer of the Total Basement Finishing basement remodeling system-- green products that will last you a lifetime. 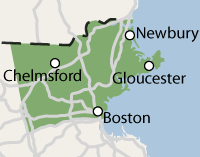 We offer free quotes throughout the Massachusetts area, including Methuen, Revere, Medford, Peabody, Arlington, Beverly, Salem and many areas nearby. Call or e-mail us today to get started! Total Basement Finishing would like to provide you with a Free Estimate and 90-page full-color book, "Basement Finishing Science", to help you design a long-lasting, healthy, and beautiful new space in your home. A copy of this book is available with every free basement quote they provide. Total Basement Finishing proudly serves Massachusetts, including Methuen, Revere, Medford, Peabody, Arlington, Beverly, Salem and nearby.